Women in Kentau. Photo CC BY-SA 3.0: Yuriy75 / Wikipedia. Some rights reserved.Feminism and gender studies are still a subject for academic research for Kazakhstan’s first generation of feminist activists. The younger generation of activists are defending the rights of the LGBT community, and public officials are simply ignoring feminism and gender equality altogether. Kazakhstan is 57th in the world in terms of female members of Parliament. The country’s Senate has only four women members out of 47, and in the lower house of Parliament there are a mere 29 women members out of 107. Admittedly, if we take another set of statistics, the country does have the second largest number of women occupying senior governmental posts in the Eurasian Customs Union (after Belarus). Meanwhile, the top jobs in all kinds of commercial structures are overwhelmingly occupied by men. Only 11.6% of chief executives of Kazakhstan’s 2,291 mining and quarrying companies are women; just 12.6% of its 867 electricity, gas, steam and air conditioning enterprises are run by women and they head only 12.9% of 9,218 agricultural, timber felling and fish processing firms. Family relationships, even in urban centres, remain organised around the “breadwinner” role. Unemployment levels are higher among women (5.5%) than men (4.4%). The highest unemployment levels are to be found among young people aged 25-34 – and here too there are more women (7.7%) than men (6.1%). And it is the same across the country. 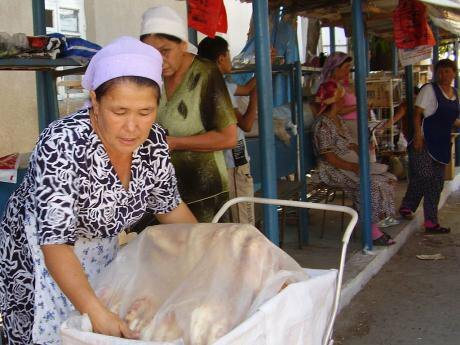 Both in the north and south of Kazakhstan, there is still a strong feeling that the responsibility for feeding the family lies on the man, and that women readily accept this situation. It was only in 2009 that President Nursultan Nazarbayev signed two gender-orientated laws that feminists had been promoting for many years. 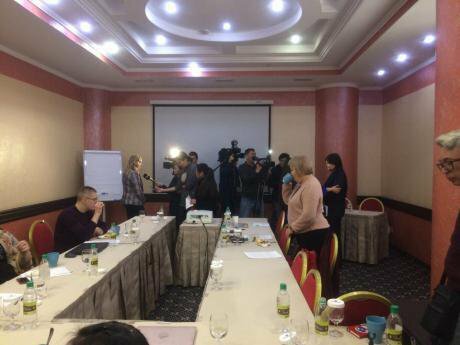 Feminist Svetlana Shakirova admits that this development was a complete surprise to activists in Kazakhstan women’s movement, and that the laws were evidently passed to satisfy western countries’ demands on the eve of Kazakhstan’s presidency of the Organization for Security and Cooperation in Europe (OSCE). Akmoldina cites World Economic Forum tables, according to which, “in 2017, Kazakhstan was number 52 out of 144 countries in terms of gender equality levels” – a high rating for the country. She considers that the two laws passed by Nazarbayev still don’t allow Kazakh law enforcement agencies to help women at risk of domestic violence. One reason, she believes, is that the women themselves “don’t want to air their dirty linen in public”. Of course, a more traditional and patriarchal way of life survives in the countryside, small towns and the south of the country – the majority of the Kazakh population lives in Kazakhstan’s southern regions and rural areas. As sociologist Mayra Kabakova writes: “a socio-psychological analysis of ethnic Kazakh value systems has revealed that family, children, health and prosperity remain the central values of today’s ethnic Kazakhs.” In general, it is the women living in big cities such as Almaty and the capital Astana who talk about gender equality, domestic violence and inequality at work. Everywhere else, feminist activists have no support from either the authorities or women themselves, who prefer a way of life in which their roles are defined as homemakers, daughters, wives, mothers and grandmothers. 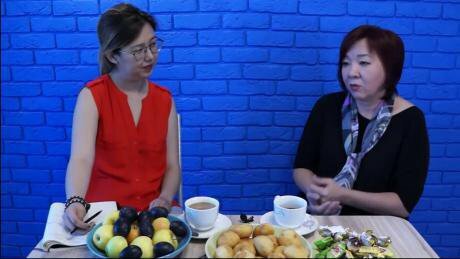 What do people know about feminism in Kazakhstan? People in power don’t always have a strong grasp on feminism. A lot of bureaucrats can quote Wikipedia, but that’s not the most reliable source of information. At the same time, it’s impossible to find any official quotes on the subject from Kazakh politicians and bureaucrats. They evidently try to avoid making public statements or asking straight questions. The attitudes of Kazakhs, both male and female, to stories of sexual harassment at work are also hard to pin down. It is supposedly the woman’s own fault: she led the man on and awakened his natural desires. Zhanar Sekerbayeva. Source: kok.teamThus, human rights campaigner Valentina Almatinskaya writes in her report, “Sexual Harassment of Women at Work”, that this issue is ignored in Kazakhstan. This research work, made available to me, includes both the personal stories of women as told by them and the famous “Belousova Case”. This case concerned Anna Belousova, a 35-year-old woman living in a village in the Kostanay region of Kazakhstan, who was subjected to sexual harassment by her boss. She reported it to the local police, but they took no action. In 2012, with the help of the Kostanay office of the UNHCR, Belousova contacted the UN’s Committee on the Elimination of Discrimination against Women. Three years later, the committee ruled in her favour and demanded that the Kazakhstan government award her “financial compensation for the moral and material damage incurred as a result of the infringement of her rights”. The government, however, refused to give her any compensation. “This case shows that even with defence mechanisms and international obligations in place, it’s still impossible to exercise your rights,” says Almatinskaya, whose work makes it clear that the government has done nothing to raise awareness of the fact that sexual harassment is a crime. Another case, which went viral on social media in February 2018, is a video of two young women kissing in public. The clip sparked a literal witch hunt against the women by the local guardians of morality, the “uyatmen”, as they are known (in Kazakh, “uyat” means “shame”). The public is divided into two camps: those who support the moralists and are prepared to shame not only these young women, but everyone who rejects the strict code of behaviour imposed on them by their patriarchal upbringing; and those who feel that, in the first place, no one has the right to show a video in public without the permission of its participants and, in the second place, well, there’s a need to discuss the country’s real problems. This row is still only gaining momentum, which is evidence that, in Kazakhstan, a new public set of views is forming, however slowly. The first NGOs run for and by women emerged in Kazakhstan in the mid-1990s. By 1997, their number had risen from six to 30, and by 2000 there were around 200. Centres for gender studies and feminist leagues appeared at the same time. Today, the situation has changed to some extent. We have seen the emergence of a new wave of feminists with a western education who are aware of all the latest trends in social development. 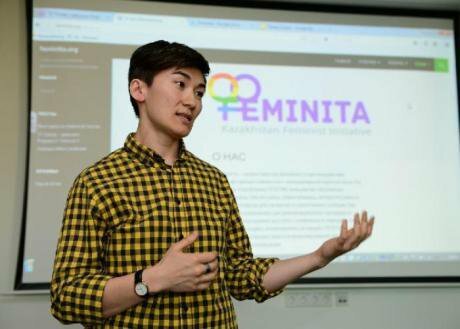 Such people can be found among the activists in the Feminita feminist initiative, who are involved in defending the rights of Kazakhstan’s LGBT community. At the same time, though, there is a second new trend in Kazakhstan alongside feminism – Islamisation. In government and state institutions there are, for example, people who consider themselves Muslims because they observe all the necessary rituals: they fast during Ramadan, they pray five times a day. In government structures, of course, staff follow a European dress code. But outside, in the street, there are more and more young women and men whose clothing distinguishes from their non-religious peers – the women wear long clothes and headscarves, the men beards and skull-caps. The fashion for wearing hijab arrived in Kazakhstan with the first Turkish high schools, as well as repatriates. Is there any crossover between these two new trends? The concept of “Islamic Feminism” is, in fact, firmly established in academic discourse in such countries as Egypt, Algeria, Turkey and Pakistan. And some Islamic feminists believe that Islam has been hijacked by men, steeped in a patriarchal mindset. In Kazakhstan, however, you will not find either any Muslim feminists or any high profile example of Islamic feminism. This may be because Islamisation is just a recent trend, and also because Kazakhstanis still don’t know enough about Islam. On the other hand, both the first Kazakh feminists and the current generation of activists embrace western values, which is why the concept of Islamic feminism hasn’t taken root in Kazakhstan. But this doesn’t mean that there are no practising Muslims among young women with progressive views actively involved in promoting civil rights. Those there are, however, have usually studied at universities in China, Malaysia or Turkey. And they may also be engaged in combating issues such as domestic and sexual violence. According to World Health Organisation statistics, around 400 women die annually in Kazakhstan as a result of domestic violence, and one in three women around the world have been subjected to physical or sexual violence. Child psychologist Margarita Uskembayeva, Chair of the Institute of Equal Rights and Equal Opportunities of Kazakhstan and director of ARASHA, a refuge for victims of domestic violence, is not only actively engaged in research into gender equality but puts her precepts into practice. And one of her projects is helping to rehabilitate women who have experienced domestic abuse. Uskembayeva’s crisis centre is not, of course, the only one in Kazakhstan: there are 28 similar centres for victims of domestic violence around the country, supported by public and international organisations. In June 2016, for example, the Prosecutor General launched a project called “Kazakhstan without Violence in the Home”, to be carried out by his Office in conjunction with the Presidential National Commission for Women and Demographic Policies; the Ministry of Internal Affairs; UN Women, the global champion of gender equality and an EU programme in Kazakhstan. The very serious social consequences of domestic violence – families destroyed, health broken, women dying – were highlighted at an specialist meeting of the Prosecutor General’s Office in 2016. Dina Smailova (on the right). Source: YouTube.Meanwhile, as regards punitive measures against people inflicting this violence, in July 2017 the president signed a law turning domestic violence into a mere administrative, rather than a criminal offence, attracting a maximum of 15 days under arrest. Dina Smailova, who heads the Nemolchi.kz (“Speak Out.kz”) movement, explains the change by the fact that “it’s a rare woman who is prepared to send her husband to prison, even if has crippled her” – and the new law at least gives her “two weeks of peace”. But how can administrative measures change the general domestic violence situation if you don’t also change the patriarchal mentality that has governed family life for centuries? It is crucial to promote intolerance towards domestic violence, and by both men and women. Our only hope in this situation is the new generation of Kazakh feminists, who stress the need to resolve concrete issues in the country’s regions – issues such as domestic violence, the kidnapping of young brides, early marriage and all the other fallout from patriarchal tradition in Kazakhstan.